Hello guys you must have heard about Windows and Linux. Those operating systems with window's logo & penguin logo. OK so today I'm gonna discuss these things with you all. you might have a confusion or a desire whats so different with Linux & Windows? so let me explain. 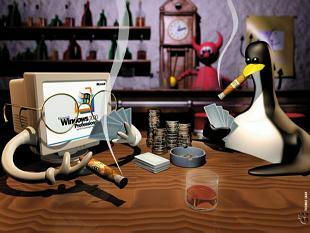 Although Linux & Windows both have a great history of their production,Windows have always dominated over Linux. This is because Windows has a great variety of apps with the ease of there use. So whats the point to discuss over it? 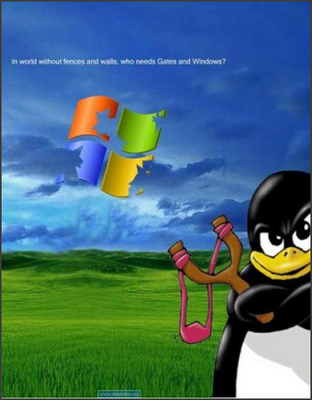 i would say NO its worth it because people have always thought that Linux is more difficult to use than Windows. But this is a big miss conception amongst all of us. I agree that using Linux far apart in the past was not an easy task, but from when Linux has became open source the whole face of it has been changed. Its like you are giving away the papers & people mould it in there way to give shapes. So is like with the Linux OS, programmers can easily manipulate the coding & run or add scripts & spread it around at no cost. This means that you can download copies of Linux anywhere, any time at no cost. But as said before, its a bit tricky to handle(my personal experience), because its hell like situation for Window user's same way when you firstly started up Windows in your earlier times.But as you gained knowledge by using Windows same will do the Linux. As everything needs practice. So Window users waiting to hear something for Windows. Yup Window too is good & great to use because it has been taught to you from your childhood so you know where is your documents,music,pics , stuff, apps of your choice etc. I think i don't need to tell you more about windows anymore but yeah for the Linux users, its my responsibility. Linux users i think you should be little jealous now because you can't every time find the software of your choice, also u need to run the scripts rather we need to run the `.exe' file. So i think you are in loss. But the question remains at the same place LINUX or WINDOWS. Well well see i have given you few points on which you can setup your criteria because at last its your own choice, who am i to tell you. so make your choice well and good otherwise you would be entangled in your own web. And before i wrap up, here is a list of few popular Linux OS as you know Windows very well. If I'm wrong somewhere then feel free to correct me. wich one iz best for me???? ?